I've had a single sheet of paper hanging prominently on our kitchen cupboard for almost a year now. I think this piece of paper will soon find it's way to a scrapbook. 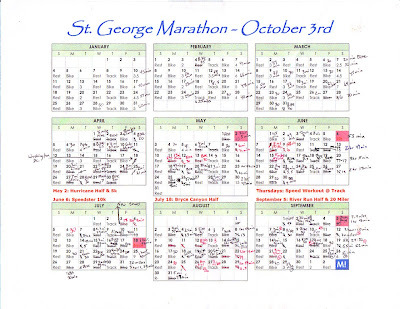 Almost a year ago I made a calendar to plan my training for the marathon. The plan came from a mix of lots of books and programs I had read about on the internet. I wanted to tailor something that would fit my schedule and hopefully prepare me. Hanging on the cupboard has been a daily reminder of where I was going and how far I have come. It seems crazy that these hours of running and hundreds of miles were all to prepare for a single event which will only last around 4 hours (hopefully). Click on the image for a larger view of my worn piece of paper.